Notification No. 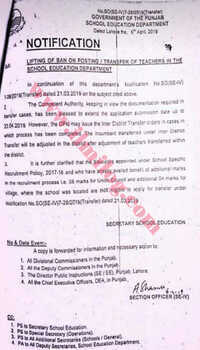 SO(SE-IV) 7-28/2019 by a government of the Punjab school education department dated 6th April 2019 regarding the lifting of a ban on posting /transfer of teacher in the school education department In continuation of department s Notification No SO(SE-IV) 7-28/2019(Transfer) dated 21-03-2019 on the subject cited above. Keeping in opinion the certification required in transfer cases, The Competent Authority has been satisfied to spread the request suggestion date up to 23-04-2019. Though, DPIs can issue Interdistrict Transfer orders in a case in which process has been completed. The incumbent transferred under inter-District Transfer will be adjusted in the district after adjustment of teachers transferred within redistrict. 3. It is additionally elucidated that the Educators named under School Specific Recruitment Policy, 2017-18 and who have just profited advantage of extra checks in the enlistment procedure I.e. 08 marks for Union Council and extra 04 marks for town, where the school was found are not qualified to apply for exchange under Notification No SO (SE-IV) 7-28/2019(Transfer) dated 21.03.2019.